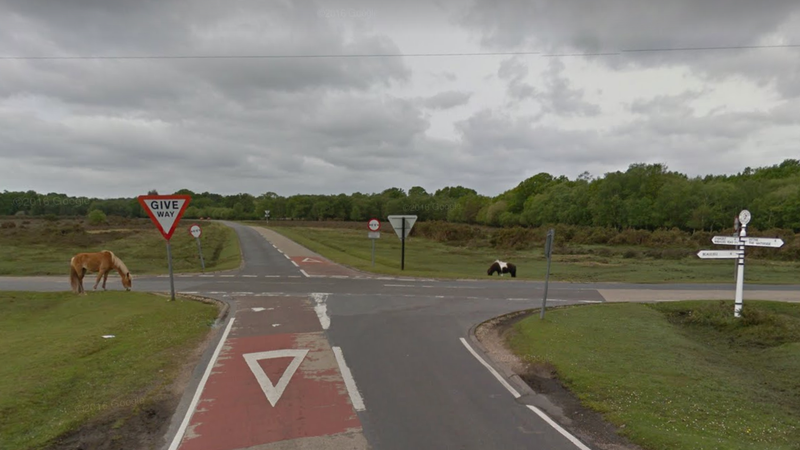 The English intersection in question is Ipley Cross, which is notorious for cars hitting cyclists, as explained by BoingBoing.net, and was recently described as one of the most dangerous intersections for cyclists in the UK. The two roads meet at a 69-degree angle, which seems to consistently create sightlines between oncoming traffic that are blocked by motorists’ A-pillars. The “constant bearing, decreasing range” (CBDR) phenomenon simply describes what happens when, say, a motorist and a cyclist are traveling at particular speeds tangent to each other on the separate roads, both traveling toward the intersection, but in the sightline that is blocked by the motorist’s A-pillar, geography, and out of visibility from the cyclist. This often leads to cyclists getting hit, simply because the two parties didn’t see each other until just before impact. Thanks to CBDR, a driver approaching the intersection at reasonably safe speeds of 37mph have a series of blind spots that coincide with the location of an oncoming cyclist traveling between 13.5mph and 17.5mph. According to the report, there have been two fatalities at the intersection. The suggested remedy is to decrease speed when approaching precarious intersections like the one at Ipley Cross, and for both drivers and cyclists to be sure to adjust their vision to look around their respective blind spots. Evidently the phenomenon is more common and better taught in aviation and sailing, but if the usual driver’s education is anything like I experienced, nothing this specific is ever brought up. Still, it’s always good to be aware of your blind spots and to check around them, and to slow down for intersections. Now you can just sound smart about it.